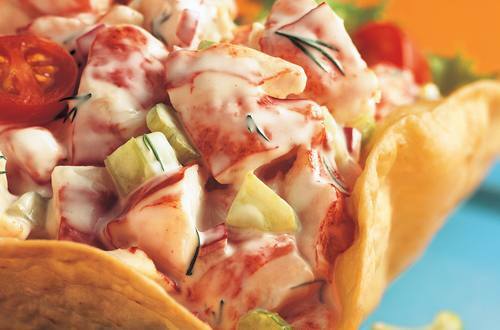 This zesty seafood salad is a perfect treat for seafood lovers! The combination of mayonnaise, onion, dill, lime juice, and cucumber make a delicious, creamy dressing that everyone is sure to love. 1 In large bowl, combine Hellmann's® or Best Foods® Light Mayonnaise, onion, dill and lime juice. Stir in remaining ingredients. Garnish, if desired, with grape tomatoes and paprika. Chill, if desired. Also terrific with Hellmann's® or Best Foods® Low Fat Mayonnaise Dressing or Hellmann’s® or Best Foods® Canola Cholesterol Free Mayonnaise.